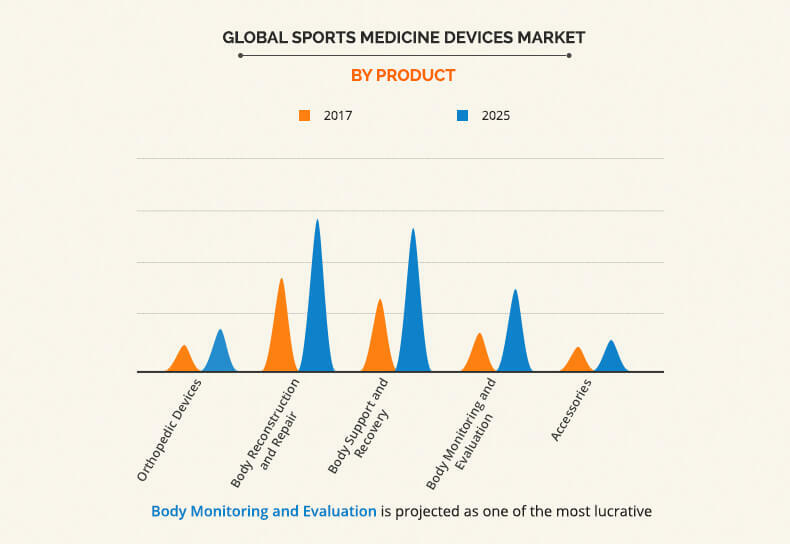 The global sports medicine devices market was valued at $7,175 million in 2017 and is expected to reach $12,730 million by 2025, registering a CAGR of 7.3% from 2018 to 2025. Sports medicine is a branch of healthcare, which deals with enhancing athletic performance and improving physical fitness. Sport medicine products promote early recovery of injuries and prevent the risk of future injuries. In addition, they are applicable across all other healthcare fields, as professionals in this field not only treat athletes but also patients suffering from various ailments. The global sports medicine devices market is segmented on the basis of product, application, and region. Based on product, the market is divided into orthopedics devices, body reconstruction & repair, body support & recovery, body monitoring & evaluation, and accessories. By application, it is categorized into knee hand&dash;wrist injury, shoulder injury, ankle&dash;foot injury, arm&dash;elbow injury, knee injury, back&dash;spine injury, and hip-groin injury. Region wise, the market is analyzed across North America, Europe, Asia-Pacific, and LAMEA. The growth of the global sports medicine market is driven by increase in demand for sports medicines, owing to rise in incidence of sports-associated injuries along with increase in awareness among people toward physical fitness. In addition, government initiatives pertaining to sports medicines increase the participation of athletes worldwide, thereby fueling the market growth. Furthermore, upsurge in demand for minimally invasive surgeries supplements the growth of the sports medicine market. However, lack of skilled professionals in this field and inappropriate administration & guidelines regarding sports medicine hamper the growth. Conversely, increase in investment of key players in the untapped economies is expected to offer lucrative opportunities for the expansion of the market. Based on product, the global sports medicine market is classified into orthopedic devices, body reconstruction & repair products, body support & recovery products, body monitoring & evaluation, accessories. These sports medicine products are essentially utilized across various medical settings to repair and restore functions of the injured parts of the body. The body reconstruction & repair products segment dominated the global market in 2017 and is expected to continue this trend throughout the forecast period. This is attributed to maximum revenue generated by use of surgical equipment for the treatment of sports injuries. However, body monitoring & evaluation segment is expected to grow at the fastest pace from 2018 to 2025, owing to shift in preference for the use of latest body monitoring & evaluation devices. Based on application, the global sports medicine devices market is segmented into hand&dash;wrist injury, shoulder injury, ankle&dash;foot injury, arm&dash;elbow injury, knee injury, back&dash;spine injury, and hip&dash;groin injury. The knee injury segment generated the highest revenue in 2017 and is expected to maintain this dominance throughout the forecast period. This is attributed to the fact that knee injury is considered to be one of the most common injuries that a sportsperson encounters, thus involving large-scale employment of sports medicine devices. Region wise, the global sports medicine devices market is analyzed across North America, Europe, Asia-Pacific, and LAMEA. North America was the major revenue contributor in 2017 and is anticipated to maintain its dominance throughout the forecast period, owing to higher adoption rate of sports medicines and increase in number of treatment procedures. However, Asia-Pacific is expected to possess the maximum market growth rate, due to surge in population, rise in awareness toward heath consciousness, increase in affordability, and improvement in healthcare facilities in the region. The major companies profiled in the report include Smith & Nephew Plc., Stryker Corporation, Johnson & Johnson (Depuy Mitek), Arthrex, Inc., Conmed Corporation, Zimmer Biomet Holdings, Inc., Breg, Inc., Mueller Sports Medicine, Inc., DJO Global, Inc., and Wright, Medical Group N.V. 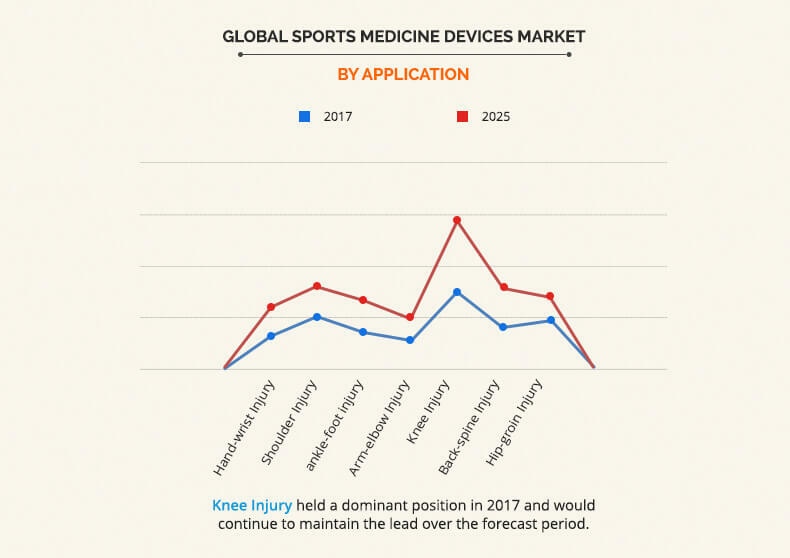 The other players operating in the global sports medicine devices market include Richard Wolf GmbH, Ceterix Orthopaedics, General Electric Company, KFx Medical LLC., Medtronic Plc, MedShape, Inc., Osiris Therapeutics, Inc., and NuVasive, Inc. 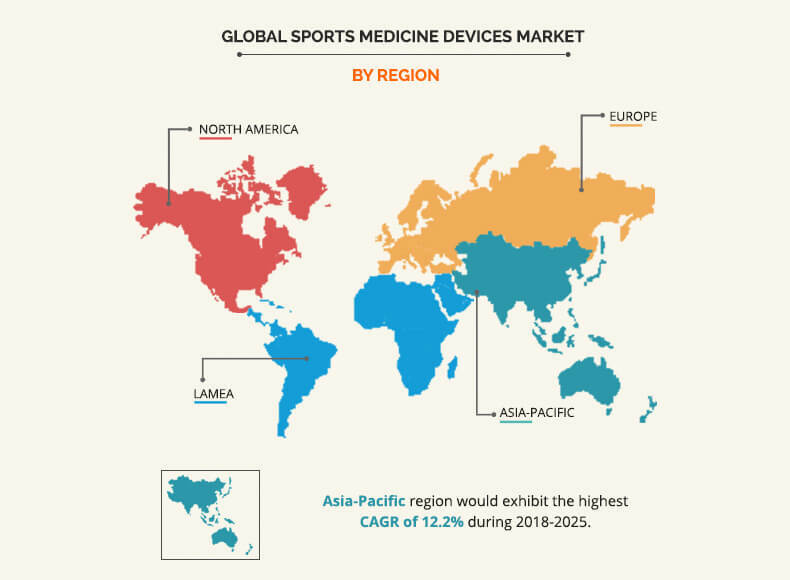 The study provides an in-depth analysis along with the current trends and future estimations of the global sports medicine devices market to elucidate the imminent investment pockets. An extensive analysis of key segments of the industry is provided to understand the products and applications of sports medicine devices used globally. Sports medicines deal with the treatment and prevention of injuries in people who are actively involved in sports activities. Sports medicine devices employ various products such as orthopedics devices, body reconstruction & repair, body support & recovery, body monitoring & evaluation, and accessories. These products have gained traction in the recent years, owing to rise in awareness toward physical fitness. The sports medicine devices market has witnessed significant growth over the years, due to increase in government initiatives in this field. This has resulted in progressive participation of athletes every year, which supplements the growth of the market. The body reconstruction & repair segment is anticipated to dominate the sports medicine market during the forecast period, due to large-scale employment of surgical and orthobiologics in the treatment of sport-related injuries. In addition, transition from minimally invasive surgeries to regenerative sports medicine for the treatment of injuries is expected to increase the demand for orthobiologics. Furthermore, among the body support & recovery products, the support devices & braces segment generated the highest revenue. Using braces & support products is the most common practice observed among sportspersons. The knee injuries segment is projected to generate the highest revenue in the sports medicines market during the forecast period. Increase in prevalence of anterior cruciate ligament (ACL) injuries and high incidence of meniscus tears among athletes contribute significantly to increased adoption of sports medicine devices in the treatment of knee injuries.